So . . . my pants are frozen. I have to admit, I kinda saw this one coming, but didn’t have much of a choice. I had to wash them and then had to dry them. Drip drying was the best way to get the bulk of the water out. Well most of it got out but the rest was frozen in place. This is not the best shot but they're not frozen enough to stand on their own, but you get the idea. They have the consistency of a frozen sponge (yes I have seen that freeze too). I have a backup plan, so don’t fret. I plan to be in my camping spot tonight with my electric heater cranked up for the next ten days, so those pants will be nice and dry (and unfrozen) in no time. 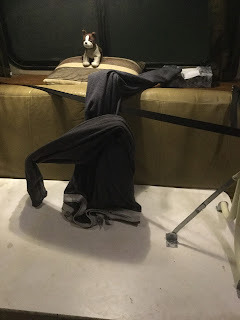 It is just one of the adventures and challenges that crops up when you live in an RV even in winter. Heat is an issue at the best of times but when you have things to dry, even more so. The key to success in this life is to just take things as they come and solve the problems as they come up one by one. So, when you have frozen pants, don’t get mad, just heat them up (without melting them or setting them on fire.